The first three songs are recent, the others a bit older. It's all relative, my main concern being the hope you'll find some to enjoy. Click band names for more info. Almost certain pleasure awaits you among the hosted posteds listed below. Thanks, hostess and hosts, for this terrific music. XTC – Senses Working Overtime - My God, what a song, a long-time fave! Television – See No Evil – in case you missed it over at extrawack! 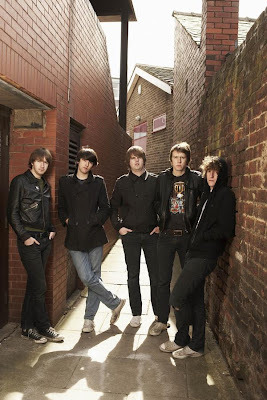 The April Skies - Memories Of Annabel - Indie-MP3 - The next one's at the same post. Yesterday I happily happened across links to a bunch of songs I've been enjoying for a good while, so I would like to share them over the next few days. Some of these are a bit long in tooth, but I hope you won't mind. And while we're at it, here are three more-recent releases. Somehow I lost contact with Spin.com's excellent site, so with this post I'm making up for lost time. Much musical enrichment still awaits you there. And in a desperate bid for some kind of thematic integrity, I pour in the potent Alkaline Trio at the end. Tiger Army - Afterworld mp3 - These Angelenos don't look all that poppy, but this song is. Powerpoppers don’t always get to experience in-your-face bat action, so if you want it, here it is, come and get it. Shall we have a contest to name that last one who carpes the screen? Right, I didn’t think so either. 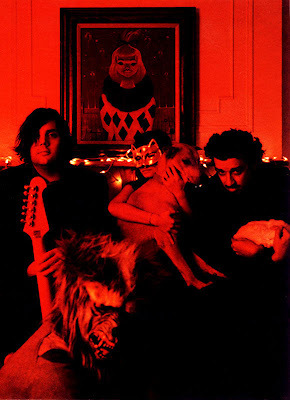 The Ladybug Transistor - Always on the Telephone mp3 - Brooklynites, love 'em. 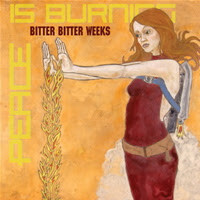 Alkaline Trio - Queen of Pain mp3 - Lately I just can't get enough of these Chicagoans. Am I going batty? Mebbe, but I still haven't posted "This Could Be Love." What a song. Yasss, yasss, I know, staggeringly creative, but thanks for saying so. God, I hate writing these blurbs, but here goes anyway. Sorry, that was graceless; let's try again. I was danged happy today to hear from several very talented folks, the fruits of whose excellent labors I am posting below. You've perhaps noticed I've got a thing going for New Yorkers The Pains of Being Pure at Heart (and I do feel your pain, Big Applers, trust me, this purity of heart thing is a total drag, but that first song down there shows you're working on it, and I'm sure you, too, can devolve and get surcease), so I was delighted to hear from guitarist/vocalist Kip Berman offering more tuneage, plus an upgraded mp3 of the one I posted Monday. Très cool and immensely satisfying. Likewise did I enjoy the product of Torontan Luke Sneyd, who, judging from that pic up there from his MySpace site, plays pretty much every instrument in his excellent songs. I'm posting two, but you can hear others here. I only got one downloadable from Prince Edward Islanders Two Hours Traffic, but it's a goodun, and you can ear more here. . .definitely worth the listen. I'm hoping eMusic will make nice with these guys, 'cause I'm definitely buying. 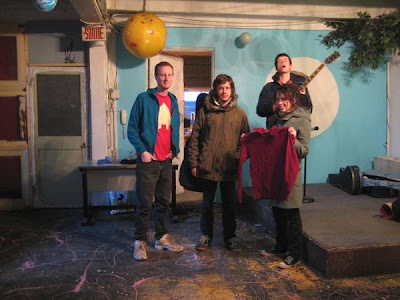 Finally, a couple of excellent songs from Hoboken, NJ veterans, The Special Pillow. Their MySpace site says their music comes in three flavors: sweet, sour, and psychedelic. Three out of three ain't bad. Two more downloadables await you at MySpace. My visitors tend to be smart (I mean, obviously), so I probably don't need to mention that the collage up there shows the four acts in the order discussed. Click for zoomview/if you want to. P.S. : That's Kip on the far right of the TPOBPAH pic. Here are some recent finds I'm really enjoying. I included several of these in Around the Blogosphere posts and am glad to be able to link directly to them now. Have a great week, youse. Frank Black - Robert Onion mp3 - from the Frank Black 93-03 "best of" compilation released last week on Cooking Vinyl. Thanks to Glorious Noise. The Pains of Being Pure at Heart - Orchard of My Eye mp3 - This and the next are part of the fabulous series of 3-track EPs from Cloudberry Records. Jets Overhead - Shadow Knows mp3 - Thanks to Spinner.com. Teenage Fanclub - Born Under A Good Sign + 3 more by the great Scots - Headphones On - Liz shows no sign of letting up, and that's a good sign indeed. Let us now enter the Dalston Oxfam Shop, where Mr. Shopper has posted a superb blend of clandestine sounds from 1994. Below are my faves. Clicking on any of the following will take you to all of the following, plus eight more. I've gotta say I've never been much of an Oasis fan, but "Fade Away" I really like. I've never seen a brickbat, either, so if you're gonna hurl, at least show it to me first. Finally, on the off chance you have spare time this weekend, a baker's handful more. Bedroom Eyes was among my earliest posts and I’ve been enjoying the one-man band’s every song ever since. As the photo clearly shows, both eyes belong to Jonas Jonnson, who happens to be from Östersund, Sweden. (Twelve more are in play for live concerts.) BE/JJ has just released his second EP, Valentine Vacancy, and once again, he’s batting four-for-four. (Ja, sure, pun intended.) I’m posting my two favorites from VV and two more from the first EP, Embrace in Stereo. 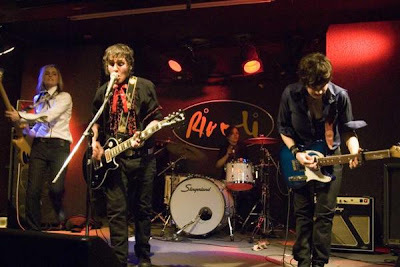 The rest can be found at the bandsite, where all are available for free downloading. Special thanks to Morten at Hits in the Car for the headsup. I've got some directs I'm dying to post but I want to put the following before you while there's time. Great thanks to the hostesses and hosts. Feeder - Seven Days in the Sun - I Am Fuel, You Are Friends – If Heather's fabulous Summer Mix doesn't yank you out of the estival doldrums, Eddie Cochran may well have been right, there just ain't no cure. We continue our celebration of "writer's" block by proceeding straight to the music. 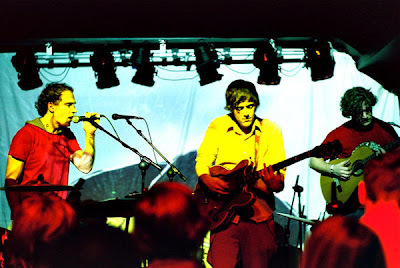 Little My – Do You Really Want to Go mp3 - Indie-MP3 posted "Cute Guts," and the Welsh band's website has lots more. The Saturday Nights - Stranded mp3 - Once again, my mp3 player comes through with a nice random selection. Danke, Helmut. Props to Gary at Seattle-Powerpop for the next three songs. Chapterhouse - Breather mp3 - The Devil didn't make me do this, but He surely made it easier. Ta, Big Guy/Force. Tasty tuna/tuneage. And btw, that espew site's pretty danged cool, if'n you like lots and lots of music. If you don't, don't go there. There's quite a variegated mix here, so hopefully every palate will find something to satisfy. Omnivores might like it all. 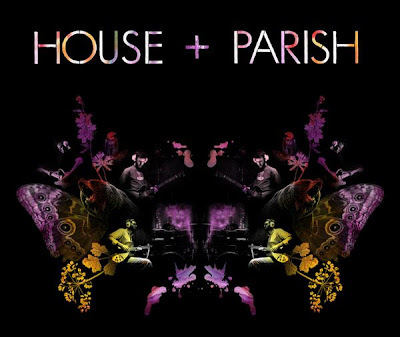 House + Parish - What Am I Still Waiting For mp3 - Thanks to and take a hike over to Die Stagediven for two more. A Northern Chorus - Skeleton Keys mp3 - Thanks to Jared at 5 Acts for the press release on the Team Clermont Summer Festival and Blue Ribbon Ball. More goodies are available at 5 Acts. Montag - Best Boy Electric mp3 - Thanks to Discollective. Speedmarket Avenue - Thanks to my mp3 player for randomly reminding me of these excellent Stockholmers on a late-night walk Saturday. Check these funsies before they're down and out. I for one extend sincere thanks to the munificent bloggers who are making them available. Once again, we'll moderate a bit on this putative day of rest. Is that really my favorite New Order song heading the list? Oui. Lots of other groovy hosteds and posteds as well. Merci, hosts. Saves the Day - Clash City Rockers - Can You See The Sunset From The Southside? - Part of an excellent post of Clash covers. . .
Bee-beep. The bird is running again, at least for now. Thanks for stopping by. Gotta post quickly. Our high-speed service was down for twenty-seven hours and just got restored, but tenuously, we are told. I'll post more as I can. Thanks to all these hosts. Transvision Vamp – Tell That Girl to Shut Up – Music of the Moment – Chris has nine more Transvision Vamp songs in this weeks’s Flashback Friday feature. Game Theory - Erica's Word - Some Velvet Blog - SVB has more by Game Theory and four by The Loud Family. The Cliks - Oh Yeah mp3 - (pic) - Thanks to Spinner.com. 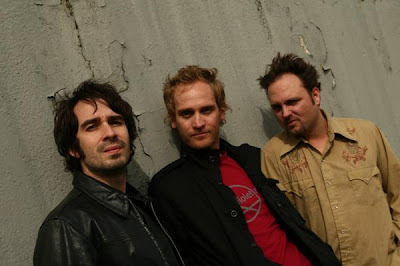 David Judson Clemmons & The Fullbliss - Trumpets mp3- Thanks to Hot Stof, who has 4 more. Gore Gore Girls - All Grown Up mp3 - Thanks to Glorious Noise. 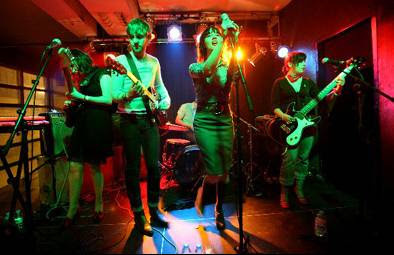 Comet Gain - Why I Try To Look Bad mp3 - Thanks to The Devil Has the Best Tuna for the heads-up at his excellent Riot Grrrls post. Sleater-Kinney - Oh mp3 - More tasty deviled tuna. It's just about to become Sunday, so I want to get this posted Saturday. Lots of good stuff keeps popping up in my emailbox, on the web, etc. I'm trying to disaggregate what we might like at a blog with the name and brief description you see at the top of this page. Hope it's doing you good. Dee blogospheres been berry berry good to Chico and pp. How excited was I to find my favorite New Model Army song in digital format? Berry. Go ahead and laugh at me, but I still love Frampton. Thanks and squeezes to those intrepid bloggers hosting this fine music. Olivia Tremor Control - California Demise & I Have Been Floated - The Rawking Refuses to Stop! Peter Frampton - Do You Feel Like We Do - Can You See the Sunset from the Southside? - The next song's in the same post, so save a click, unless you're just into it. Squeeze - Up The Junction - Can You See the Sunset from the Southside? 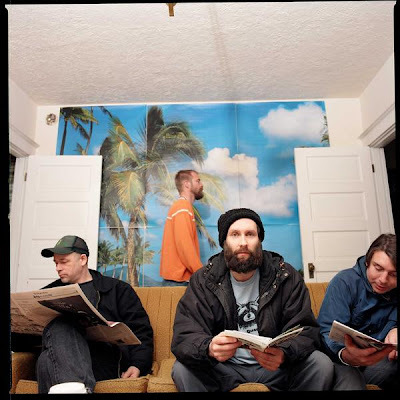 I know, I posted this Elf Power song before, but it's my favorite by them and the last.fm thing doesn't work for me anymore, and I just found it elsewhere, and anyway, why not, etc. Most of these others I happened upon within the last day to a week. I posted a nice one by The Contrast back when I was a babyblogger (toddlerblogger now, I flatter myself to think), along with several other excellent songs from Rainbow Quartz. In case you're interested. Click band names to satiety. The Triangles - Meatblanket mp3 - Thanks to Coast is Clear; two more there. Yeh, on Monday I tried something cute and only posted about half the music of the spheres I'd found, and now I've got a glorious buildup sirensonging to be posted, so here goes. Needless to say, I soiled me armor over the Teenage Fanclub song, but it's all to the good. As I've said before and no doubt will again ad pukeum, I feel a certain sense of urgency about letting you know about these because some of them don't stay up all that long, so the two-day delay is quite inexcusable. Ta, hosts! Teenage Fanclub - Slow Fade Pictures - Headphones On - Great blog I just found tonight. Shocking Blue - Send Me a Postcard - Raven Sings the Blues - Yeh, the "Venus" Dutch treaters. The Farm - Groovy Train - extrawack! Television - See No Evil - extrawack! Here's a little mix of recent finds and older buds. If you need to know which is which, just ask. Right. 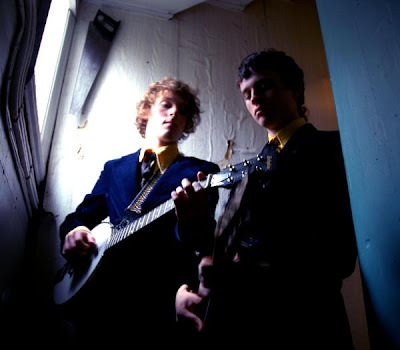 Moonbabies - Take Me To The Ballroom mp3 - Click here for more. The Layaways - Click bandname for more free dls. The Like Young - Sabine & Me mp3 - Several more available at Powerpopulist. Click here. Rahther love 'em. Visiting all these great, great blogs can make one feel quite inadequate. At least there's fine music to help one make it through the plight. Thanks, ye who host. Uh-oh, feels like another mellow mood is upon us. Not bad for a Sunday, though, and we like the songs. By tomorrow we should be more perky. Have a good day of rest. Sparrow House – Blindfold Waltz mp3 - Thanks 'fork. I believe it was the estimable NY Mary over at PowerPop who first broke Malaysian poppers Couple to the needy New World, or at least to this dry corner of it. I loved them immediately and was mighty happy this week to hear kind words of greeting from band member, Aidil. Aidil gave me leave to post the two songs below, with promise of another to follow. Since a goodly number of visitors to this little cosa mia were ushered here by NY Mary in the first place, I’m sure many of you already know the songs, but here they are anyway, just in case. Oh, and here's the article in which Rolling Stone named Couple as one of the 25 Best Bands on MySpace. And if you haven't seen the video, PowerPop has it here. Irresistible. I just tonight found some new blogfriends, they don't know me, yada-yada, let's get to it. The Moths - Tumbling Down (Demo) - Good Weather for Airstrikes - Wait for the chorus. 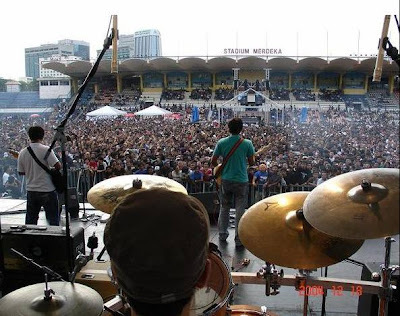 My new buds at Indietastic have an excellent post on Athens bands. These are the two I liked best; they've got twenty more awaiting your perusal. They're all at the same post, so click the first one to get to the rest. Thank you, dear hosts and hostesses.